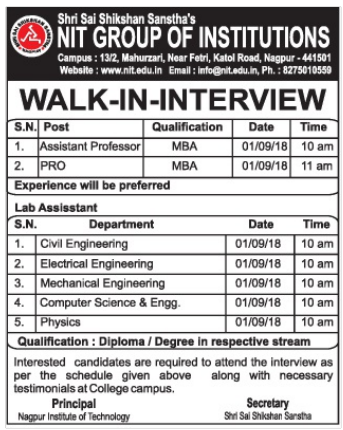 NIT Group of Institutions, Nagpur has advertised in the LOKMAT newspaper for recruitment of Assistant Professor / Lab Assistants / PRO jobs vacancies. Interested and eligible job aspirants are requested to walk-in on 01st September 2018. Check out further more details below. About College: Nagpur Institute of Technology is a brand name in Central India for conveying Quality Education that gathers International Standards. It is one of the rapid budding technological institutes of elevated status in the region and is one of the Top Engineering Colleges in Nagpur. This institute is very well known for its farsighted management, full-fledged and marked guidance, superior enthusiastic faculty, state of art infrastructure, towering academic principles, stringent academic restraint, outstanding co-curricular and extracurricular bustles and much endowed scholars. The college places exceptional and unique prominence interrelated to the expansion of the students such as all round persona progress, option of international revelation at UG echelon, temperament and proficiency edifice, industrial training and industrial projects. Nagpur Institute of Technology was established in 2008 and is a self-financed institution affiliated to RTM Nagpur University and approved by All Indian Council for Technical Education (AICTE), New Delhi and Government of Maharashtra and Directorate of Technical Education (DTE), Mumbai. How to Apply: Interested and eligible candidates are requested to attend the Walk-in interview by bringing their CV with full details along with originals & copies of certificates and 02 recent passport size photos to the following walk-in address.